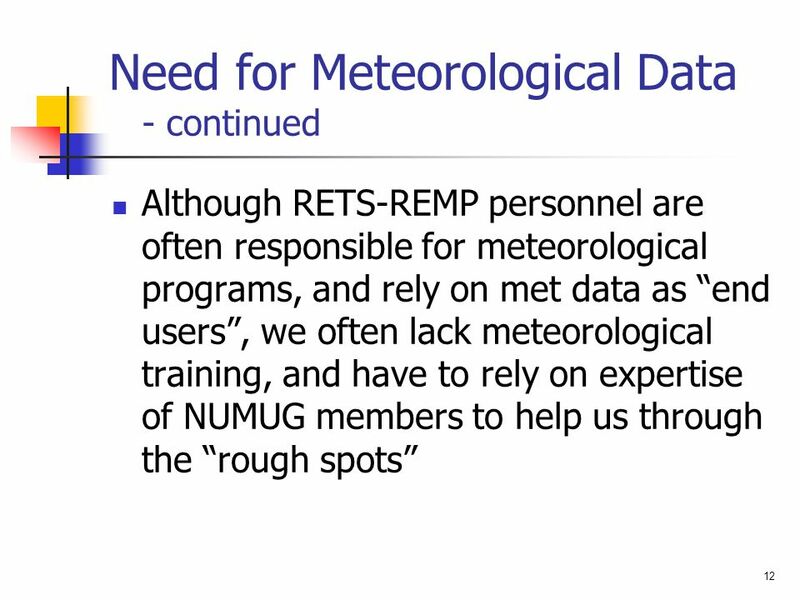 1 Sejkora: What is RETS-REMP? 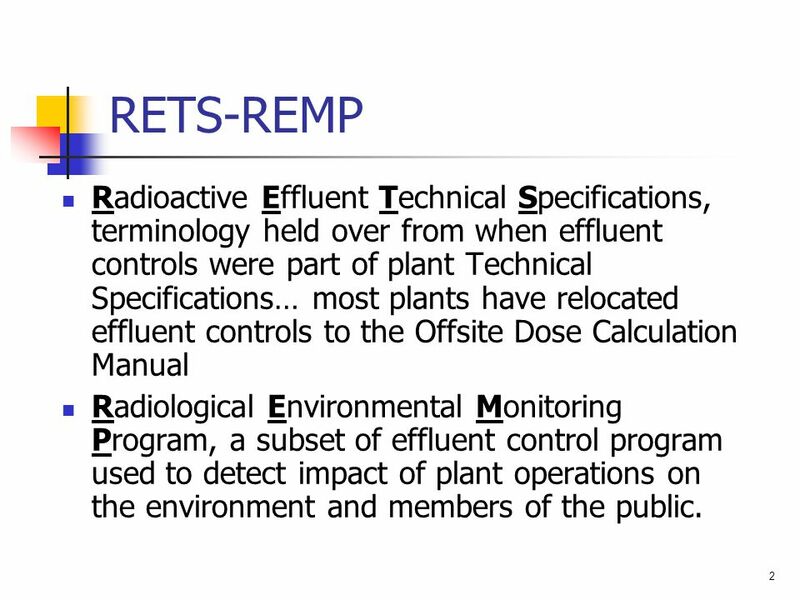 2 RETS-REMP Radioactive Effluent Technical Specifications, terminology held over from when effluent controls were part of plant Technical Specifications… most plants have relocated effluent controls to the Offsite Dose Calculation Manual Radiological Environmental Monitoring Program, a subset of effluent control program used to detect impact of plant operations on the environment and members of the public. 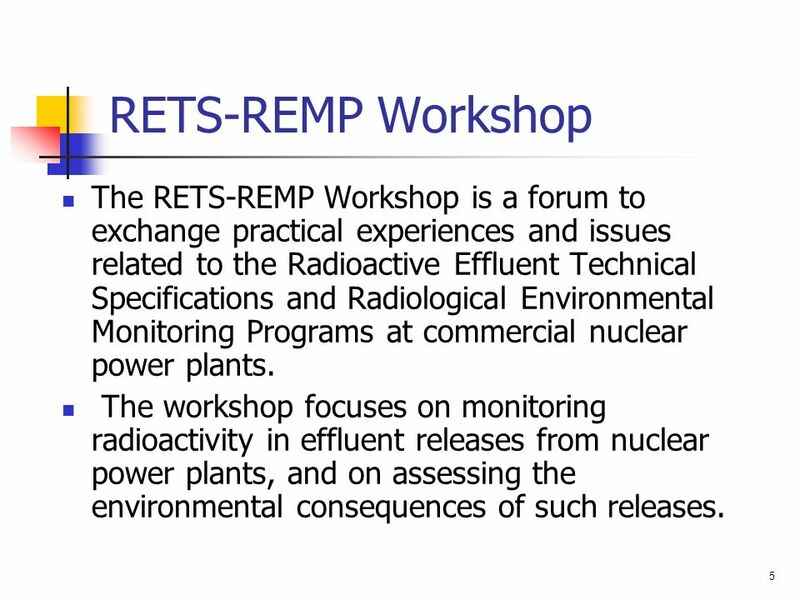 5 RETS-REMP Workshop The RETS-REMP Workshop is a forum to exchange practical experiences and issues related to the Radioactive Effluent Technical Specifications and Radiological Environmental Monitoring Programs at commercial nuclear power plants. 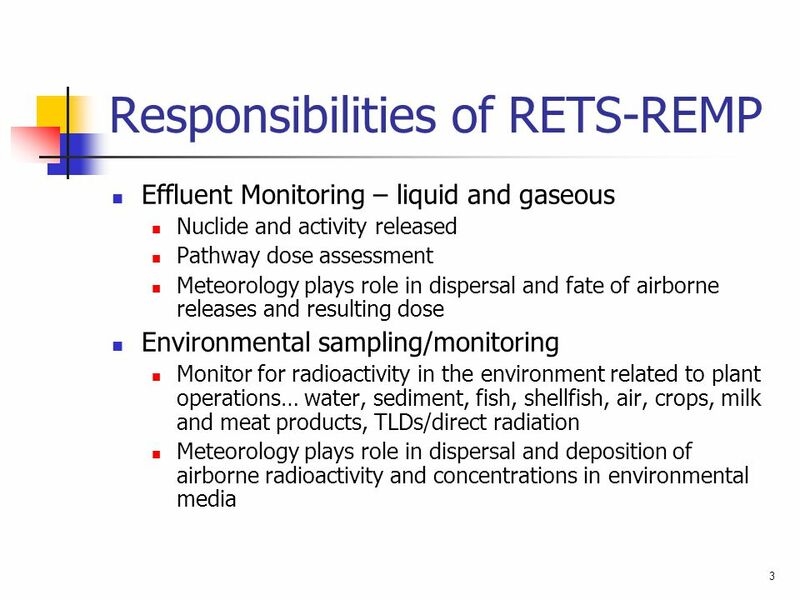 The workshop focuses on monitoring radioactivity in effluent releases from nuclear power plants, and on assessing the environmental consequences of such releases. 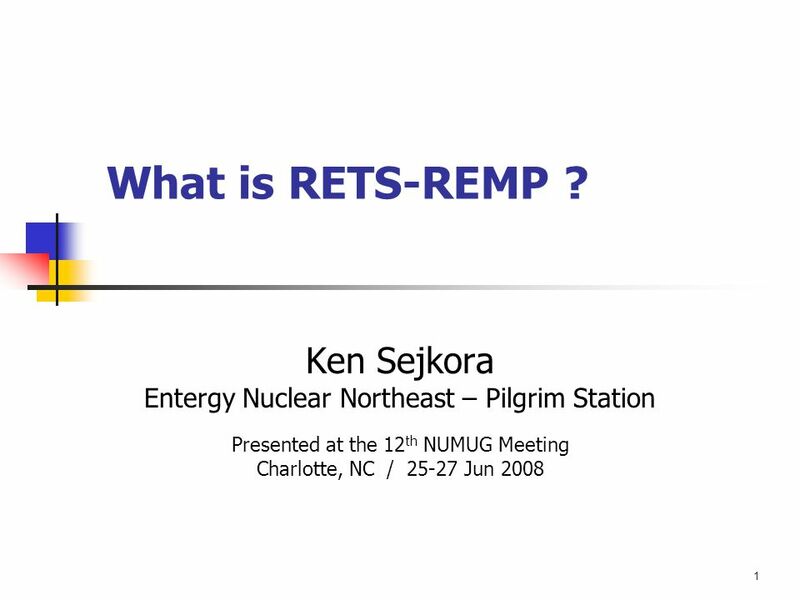 Download ppt "Sejkora: What is RETS-REMP?" CAC Meeting May 20, 2008 Computer Modeling of Impacts. 1 The Advisory Team for Environment, Food, and Health. 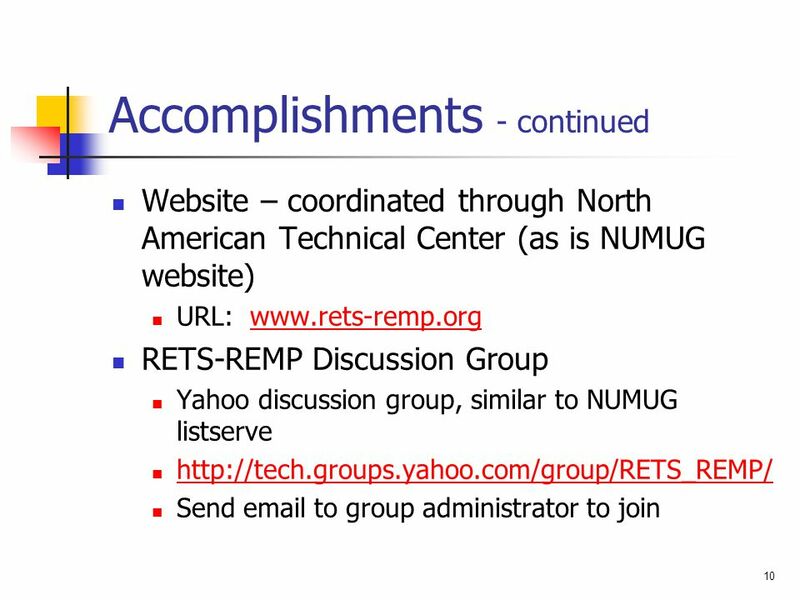 1 Implementation Status of the U.S.-IAEA Additional Protocol Thomas Grice NMMSS Users Meeting May 20, 2009 Denver, CO.
What is NUMUG? 1 Kenneth G. Wastrack Tennessee Valley Authority Presented at the 12 th NUMUG Meeting Charlotte, NC / June 2008. Carbon 14 Gaseous Effluent Dose The importance of Human Performance Ron Chrzanowski Corporate Chemistry Manager Exelon Nuclear June 27, 2011. 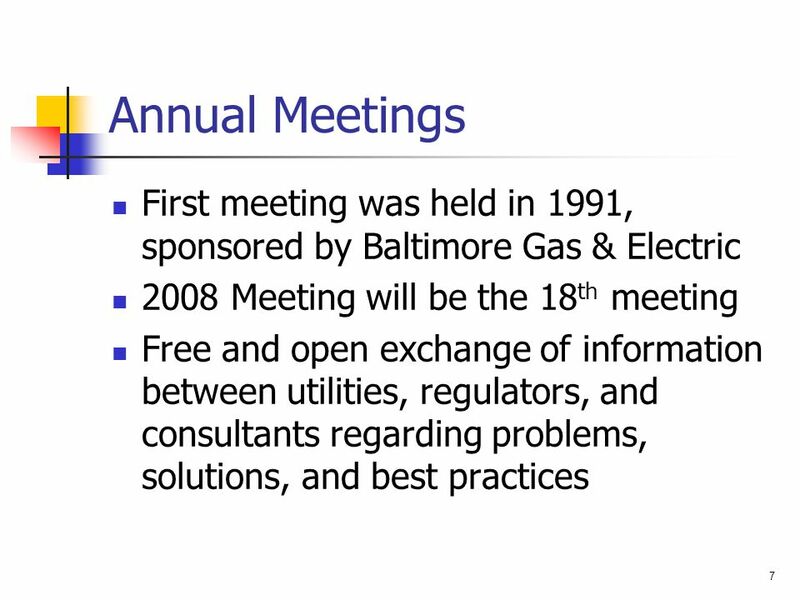 The Changing Faces in Effluent and Environmental Monitoring Douglas Wahl Exelon. PUBLIC DOSES ESTIMATION BASED ON EFFLUENTS DATA AND DIRECT MEASUREMENTS OF TRITIUM IN ENVIRONMENTAL SAMPLES AT CERNAVODA E. Bobric, I. Popescu, V. Simionov. 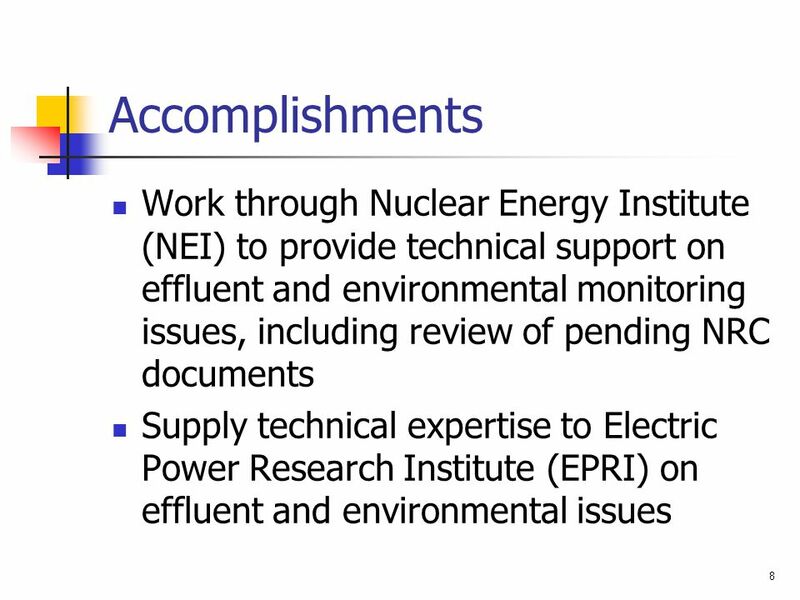 RETS-REMP WORKSHOP June 25, 2012 Greg Jones R. E. Ginna Nuclear Power Plant Constellation Energy Nuclear Group, LLC 1. 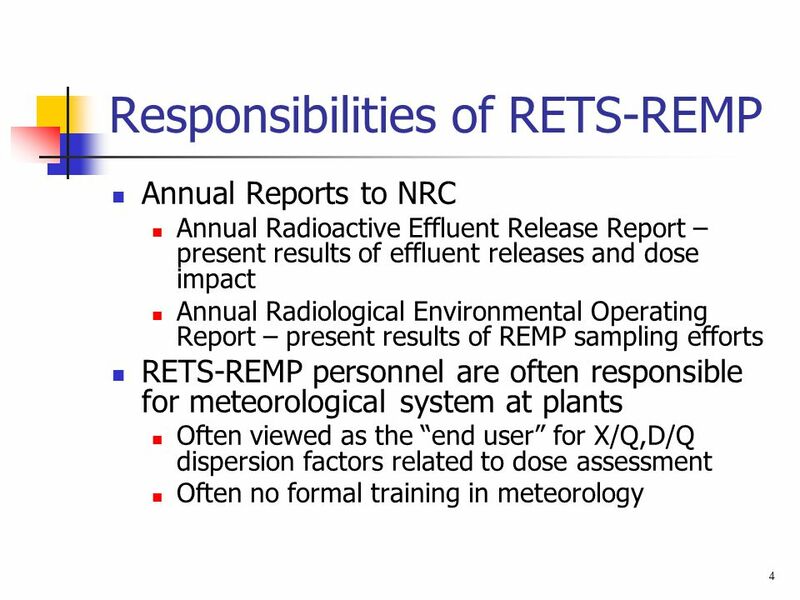 14th Annual RETS/REMP Workshop June 28-30, 2004 U.S. Nuclear Power Sister Plant Radiological Effluent Release Comparisons J.T. Harris 1,3, D.W. Miller. 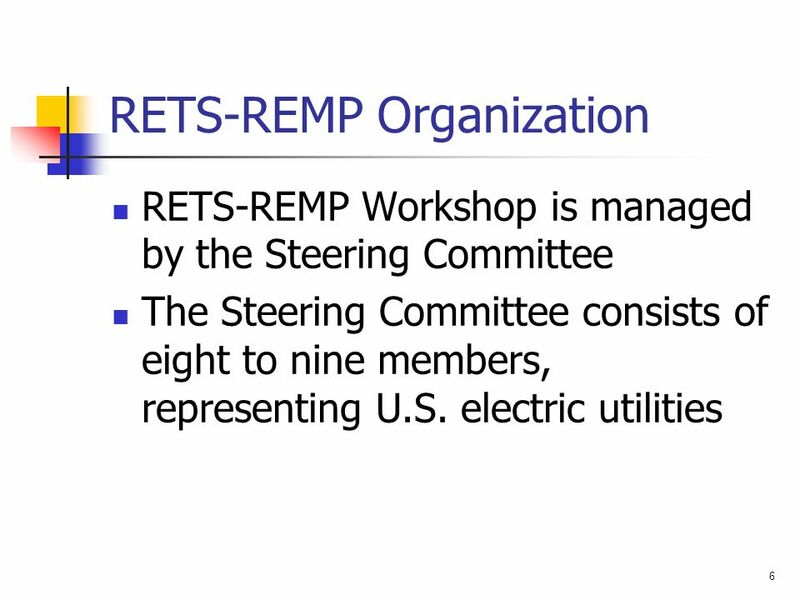 An Introduction to the RETS/REMP Steering Committee Greg Barley. Session 11: Modeling Dispersion of Chemical Hazards, using ALOHA 1 Modeling Dispersion of Chemical Hazards, using ALOHA Prepared by Dr. Erno Sajo, Associate. REMP Sampling Strategy 2004 RETS/REMP Workshop Jim Key Key Solutions, Inc.
RETS – REMP Workshop NRC Activities June 25, 2007 Presented by Steve Garry. Policy & Strategy: Environmental Protection George Oliver RETS/REMP Conference June 25-27, 2007. 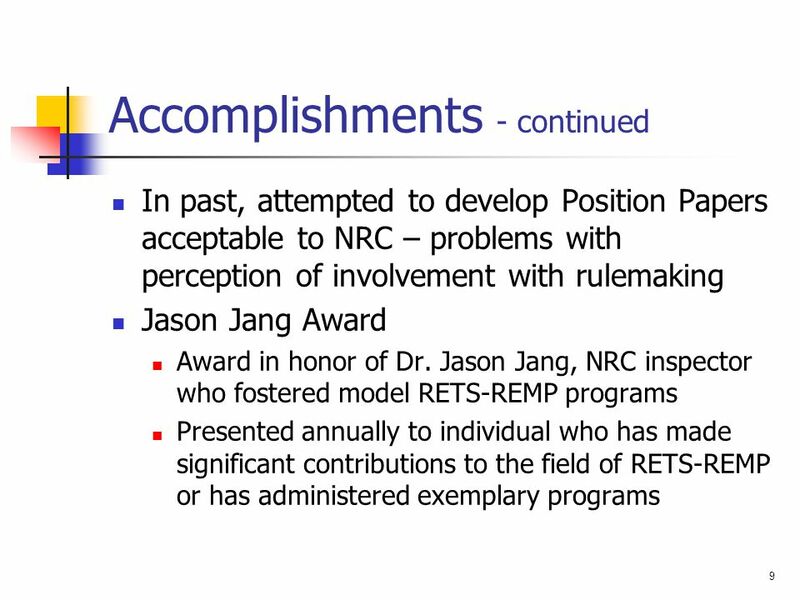 Meteorology Combined License NRC Review Process Meteorology Joseph Hoch Physical Scientist U.S. Nuclear Regulatory Commission June , 2008 Nuclear. 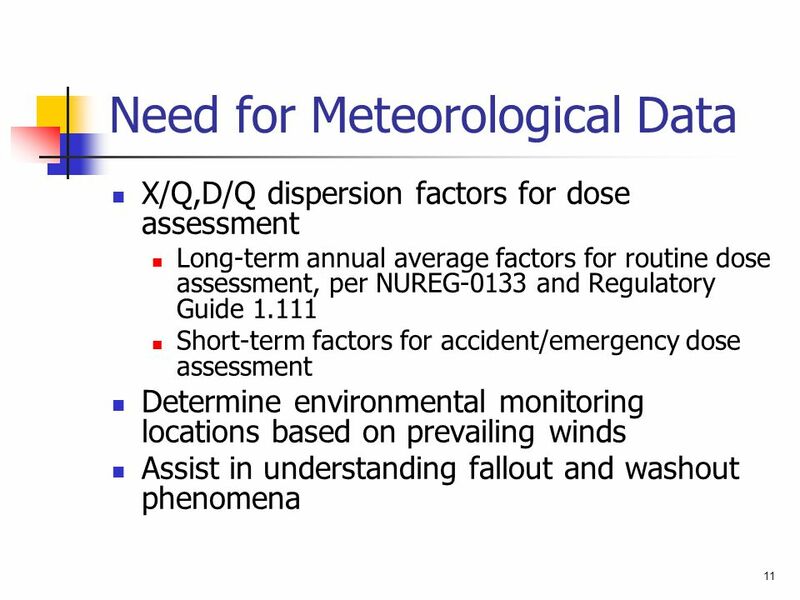 Investigation of Meteorological Tower Siting Criteria Ken Sejkora Entergy Nuclear Northeast – Pilgrim Station Presented at the 15 th Annual RETS-REMP Workshop.